The stadium is a new host of Sydney Swans and Greater Western Sydney Giants AFL matches, as well as International Twenty 20 Cricket matches between Australia and India. It has also hosted many major concerts from international and Australian music acts including AC/DC, U2, Rolling Stones and Andre Rieu. Catch the action from some of Australia’s biggest games at ANZ Stadium in Sydney! Whether you’re here to watch the State of Origin, Bledisloe Cup or the NRL Grand Final, Comfort Inn & Suites Burwood offers a great location, facilities and modern rooms to make your trip hassle-free, comfortable and affordable. 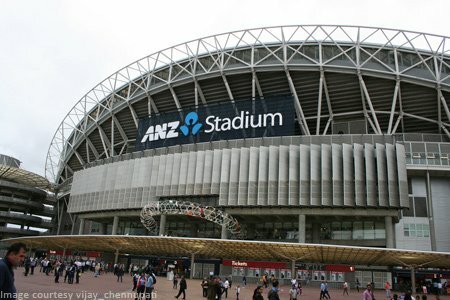 ANZ Stadium is located at Olympic Boulevard, Homebush Bay, New South Wales at the Sydney Olympic Park precinct. Comfort Inn & Suites Burwood offers affordable Homebush accommodation minutes away from ANZ Stadium. Our Stadium accommodation offers comfortable rooms at highly competitive prices. Ranging from standard rooms to studios and serviced apartments, Comfort Inn & Suites Burwood is a great place to stay if you’re travelling to Sydney for a game, concert or any other events at ANZ Stadium. We’re located just 15 minutes from the Stadium, making travel to events a breeze! We can also provide a free courtesy bus to this venue for special events and large group bookings. Click below for some of the major attractions nearby.